When will the violence against Hajra, Sonia, Azma stop in Pakistan? It has happened so many times it does not even have the effect that lasts beyond superficial outrage and barely-meant words of condolence. It has happened so many times real flesh and blood people have been reduced to banal statistics. Six men, four young, two old, one unidentified woman, three children whose limbs have been severed, five policemen dead or fatally injured. The number varies, the names remain interchangeable, the faces become indistinguishable, but the main story remains unaltered. The victim is the Shia Hazara. Hazara. Shia Hazara. Or without any prefix of faith. Their life is of no consequence until their death becomes the headline of the day, three days, a week if they happen to be large in number. They look identical to all those who look at them through the pictures that appear of their dead bodies, of their wailing fathers, of their beating-their-chest mothers, of their siblings with a stony silence in their unblinking eyes, of their children with incomprehensible grief plastered on their unsmiling faces, of their spouses who do not have the courage to see the mangled body of their partner with whom they share a history and a family. They are identical to those who kill them simply for being. Imagine. Your life is marked by what you look like, your ethnicity, your faith; how you fold your hands in prayer, and where you kneel to ask your Creator to show you a path of kindness, acceptance and forgiveness because some of His people make it hard for you to exist. The factors of your existence that you had no control over delineate the roadmap of your life. How you will be, how you will behave, where you will live, how you will live, the outward signs of faith that you will practise, in front of whom you will be allowed to practise your faith, where, and how much. And existing like a prisoner in your place of birth, in your homeland, you will never have the security of what most of your compatriots take for granted: returning home unharmed every day without fear of a bullet or a bomb. Imagine. 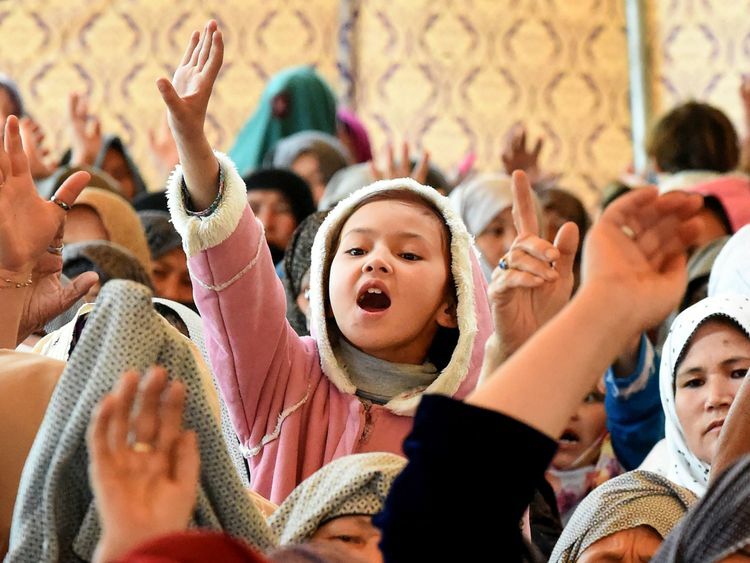 Hazaras most of whom are Shia, a Persian-speaking ethnicity of Mongolian descent, immigrants from Bamiyan, a Hazara region in central Afghanistan, are settled in Quetta, Balochistan. Those who live in Quetta are those who were not forced to flee the country not to have a better life but to simply ensure that they did not die. In Quetta, they mostly live in two gated, highly-protected localities: Marriabad and Hazara Town. Apart from their diurnal existence in which they need to be on constant guard, they also have frequent holy pilgrimages to Iran and Iraq. That is also when their life is endangered. Their age, background and gender become irrelevant when they are all marked as the undesirable group that must either be restricted to its own corner or must be eliminated. By whom? There is no single answer. Despite protection of the state, despite vigilance of the police and other law enforcement agencies, despite provision of security at most places of prayer and business, despite reduction in targeted attacks and acts of terrorism, there is no real sense of security for the Hazaras in Pakistan. The latest attack is a testimony to that. On Friday, April 12, 2019, in the Hazarganji market in Quetta, 20 people died in a blast that was said to be because of an Improvised Explosives Device hidden in a potato sack in a greengrocer’s shop. As per their website, the Daesh have claimed responsibility of the attack. The four-day protest at the Quetta Western Bypass of the families of the deceased and other members of the Hazara community ended after their meeting with the Minister of State of Interior Sheharyar Afridi, Prime Minister’s Special Assistant on Overseas Pakistanis and Human Resource Development Zulfiqar Bukhari and Chief Minister Balochistan Jam Kamal Alyani. While the sincerity of the provincial and federal government to end targeted attacks on the Hazara and other persecuted communities may be sincere, and there are steps for implementation of a mechanism of security to prevent acts of terrorism, not much will change until there is a clear message to all those who use sectarian violence as a tool of chaos and political or other hegemony: no attack will go unpunished. In Quetta, from January 2012 to December 2017, 509 members of the Hazara community have been killed, and 627 injured, as per the 2018 report of the National Commission for Human Rights. 509 killed in five years is too many dead. For any nation that has a conscience that is alive. In Quetta, there is a Hazara graveyard. It is known as Bihisht-e-Zainab. Bihisht is paradise in Persian. It is not only marked with graves of the dead of the Hazara, it is full of the voices and the noise of the living Hazara. Almost every second Hazara family has lost a loved one to an act of terror, almost every Hazara is linked to the other with the bond of grief that is forever. In Bihisht-e-Zainab, there are shops, children laughing, people of all ages interacting and chatting, people of all ages playing or cheering the traditional game of Sang Girag, and remembering their beloved deceased on happy occasions like Eid. Imagine. A graveyard is a safe place for the Hazara in their hometown. The Hazara of Quetta, scared yet resolute, broken yet brave, find solace and protection among the silent graves of their loved ones who died too young, too early, in an ear-piercing, body-crushing, soul-numbing blast. And: Prime Minister Imran Khan, the Hazara of Quetta need to hear from you. Not just when they lose another loved one. They need you every day when they go to their Bihisht-e-Zainab to feel safe. Tell the Hazara that they are safe any and everywhere in Quetta. And in the rest of Pakistan. Tell the Hazara in person: they are not alone. Tell the Hazara: you are with them. Every day of their fear and pain-filled life.